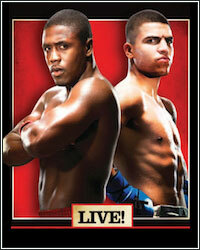 Sources close to the information have informed us that former WBC welterweight champion Victor Ortiz and current IBF welterweight champion Andre Berto will indeed meet again for a highly-anticipated rematch some time in January of 2012. Their first fight, which took place this past April, was a Fight of the Year candidate, with both fighters exchanging a pair of knockdowns in an action-packed back-and-forth battle. It was Ortiz, however, who walked away with the victory and he was awarded a showdown with undefeated pound-for-pound champion that would earn him a career-high payday. In a recent interview, Berto's promoter, Lou DiBella, made it crystal clear that there wouldn't be a rematch unless Ortiz, along with Berto, subjected himself to random blood and urine testing. "There won't be a Berto fight if he doesn't get tested for PEDs," DiBella proclaimed. "And I'm not accussing of anything." According to our source, DiBella's request will be granted as both fighters will also undergo the same type of random blood and urine testing that Ortiz participated in for his fight with Floyd Mayweather. This will be the first fight not involving Floyd Mayweather to institute more stringent testing for fighters. A grudge match between WBC #1 ranked contender Devon Alexander and Paulie Malignaggi is also said to be on tap as the co-main event. Both Alexander and Malignaggi have been taking verbal jabs at each other throughout the year, which should make for an entertaining matchup. Although it's unclear as to whether or not that bout will actually come to fruition, our source tells us that Ortiz vs. Berto II is essentially a done deal.